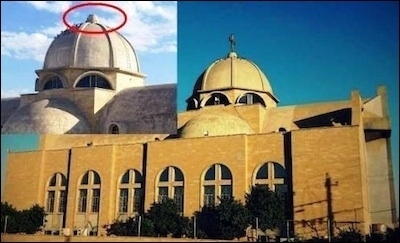 Before and after photo of St. Ephrem Cathedral — former seat of the Syriac Orthodox Archdiocese — in Mosul. To the right is how it stood before the Islamic State took over last year. To the left is after — with the Cross broken off the cathedral's dome. The Islamic State posted notices around the captured city of Mosul announcing that the Syriac Orthodox Cathedral Church of St. Ephrem, seized a year ago, is to be become the "mosque of the mujahedeen," or "jihadis." The new name was announced on the anniversary of the date the church was seized. The Islamic flag stating the shehada—that "there is no god but Allah and Muhammad is the Messenger of Allah"— was further draped over the building. "If they changed a church to a mosque it is further proof of their cleansing," said the president of A Demand for Action, a group advocating for the protection of minorities in the Middle East. "They destroy our artifacts, our churches and try to erase us in any way they can." Around the same time, the Islamic State has begun to blow up Christian homes, at least 16.